M-1000 Ultrasonic Set Point Controller - Deeter Electronics Ltd. M-1000 Ultrasonic Set Point Controller - Deeter Electronics Ltd. The M-1000 analog controller is a multipurpose dual sensor controller with a wide range of uses in the process control field. It was designed to work with any of Migatron’s analog output sensors as well as a temperature probe for temperature compensation. Its easy program modes allow instruction entry and review of previously programmed values. It accepts a standard 0-20 mA, 4-20 mA, 0-5V, 2-10V, 0-10V analog input. The microcontroller digitally scales the inputs with near and far scaling points, then this information is displayed on a 4 1/2 digit digital display. This attribute is also contained in an optional second channel input for added expandability. The controller can also supply 24 volts up to 110 mA to the sensors. The outputs consist of four solid state relays for use as outside limit monitors. These outputs can be programmed as either normally open or normally closed and can switch 2-130 VAC or VDC 100 mA DC or 50 mA AC continuous. A RS485 serial communications port is also supplied. Communication can take place for baud rates of 300, 1200, 2400, 4800, and 9600. Each controller can be configured to transmit standard ASCII code up to a maximum distance of 10,000 feet. The M-1000 samples its inputs at a rate of 25 times per second, and includes auto zeroing. Its analog to digital converter is accurate to +- .05 mV and its converter is also rated as having a drift rating of 50 ppm per degree Celsius. The M-1000 is powered by 120 VAC, 8 watts and all of the inputs and outputs are tightly secured with reliable screw clamp cable connectors. 4 1/2 Digit Display, used to display the data to the user, and to display the set values while programming. Relay Indicator LEDs, to indicate which outputs are on, and flicker when in the program state. Program Mode selector when pressed displays program choices. LED Indicators for channel 1 and channel 2. Up Cursor increases numerical value. Down Cursor decreases numerical value. Enter button puts program choices into memory. 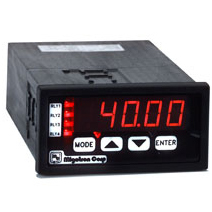 The M-1000 controller provides 4 individual set points with independent relay outputs that can be programmed either N.O. or N.C. The most common application for this unit is in level control. Using the Mode Selector along with the Up and Down Cursors, a High set point (SP2) and a low set point (SP3) can be set to keep a level in between a specific window. Then using the same function keys an Alarm High (SP1) and an Alarm Low (SP4) set point can be set to prevent the level from getting dangerously high or low. During this operation the M-1000 is also providing the user with a continuous position update of the level by means of its digital display. This display can be scaled to read out in many different units such as inches, centimeters, gallons, etc. Wire power to terminals marked 115 VAC. Wire sensor to terminals marked channel 1. Wire temperature probe to terminals marked channel three if temperature compensation is desired. To program enter program code “58”, or enter “25” to go directly to steps 16 & 17. Six factory presets are available. Factory preset 1 4 to 40″ with 4 – 20mA input, 2 8 to 80″ with 4 – 20mA input, 3 4 to 40″ with 0 – 10volt input, 4 8 to 80″ with 0 – 10volt input, 5 0 to 20 to display current input, 6 0 to 10 to display voltage input. If one of these is not desired press MODE to skip this step. Set meter for single channel operation. Temperature compensation and display are available by programming “F” for Fahrenheit or “C” for centigrade or “-” for no temperature compensation. Scaling value for “Lo” set point, or the value the meter will display when the sensor is giving a 4mA output. Scaling value for “HI” set point, or the value the meter will display when the sensor is giving a 20mA output. If temperature compensation has been selected, the distance that the sensor is away from the target when the sensor is outputting its lowest value needs to be entered after the display flashes “LDSt”. (Example: if a 4-20mA sensor is 4 inches away when it generates a 4mA output enter “4.00” here.) This step will not appear if temp. comp. has not been selected in step 7. If temperature compensation has been selected, the distance that the sensor is away from the target when the sensor is outputting its highest value needs to be entered after the display flashes “HDSt”. (Example: if a 4-20mA sensor is 40 inches away when it generates a 20mA output enter “40.00” here.) This step will not appear if temp. comp. has not been selected in step 7. To set up display the meter will flash “dISP”. For channel 1 enter CH1. To display channel 1 and temperature enter “ALtt”. The display will automatically alternate every 3 seconds between channel 1 and temperature. This step will not appear if temp. comp. has not been selected in step 7. Polarity allows the state of the relay to be changed from N.O. to N.C. At this time the LED indicator of the chosen relay will flicker. This step needs to be repeated for each of the four relays. Set point is the numerical preset value at which point the relay changes state. At this time the LED indicator of the chosen relay will flicker. This step needs to be repeated for each of the four relays. Wire sensors to terminals marked channel 1 and 2. To program enter program code “58”, or enter “25” to go directly to steps 16, 17, 18. Set meter for dual channel operation by enabling channel 2. If temperature compensation has been selected, the distance that the sensor is away from the target when the sensor is outputting its highest value needs to be entered after the display flashes “HDSt”. (Example if a 4-20mA sensor is 40 inches away when it generates a 20mA output enter “40.00” here.) This step will not appear if temp. comp. has not been selected in step 7. To set up display, the meter will flash “dISP”. For channel 1 enter “CH1”. To display channel 2 enter “CH2”. To alternate between channel 1 and channel 2 enter “ALt”. To alternate between channel 1, channel 2 and temperature enter “ALtt”. The display will automatically alternate every 3 seconds. To subtract channel 1 from channel 2 for a differential display enter “C1-2”. Note: To program CH1-2 for thickness measuring the following procedure must be followed. (See Picture below) Place CH2 sensor to your left and CH1 sensor to your right. Place a ruler so zero starts at the beginning of CH2 sensor. In the example below the sensors that are used are RPS-401A-40. They are adjusted to provide a 4mA output at 4″ and a 20mA output at 40″. When going through steps 9-12 for both sensors the following entries need to be made for CH1 step 9 (Lo 4), step 10 (36.00), step 11 (HI 20), step 12 (00.00). The following entries need to be made for CH2 step 9 (Lo 4), step 10 (4.00), step 11 (HI 20), step 12 (40.00). With the meter set up in this mode the thickness of a target can be measured beyond 4″ of each sensor and over a 32″ range. Enter which channel the relay is to be controlled by: CH1, CH2, or both. “Set point” is the numerical preset value at which point the relay changes state. At this time the LED indicator of the chosen relay will flicker. This step needs to be repeated for each of the four relays.